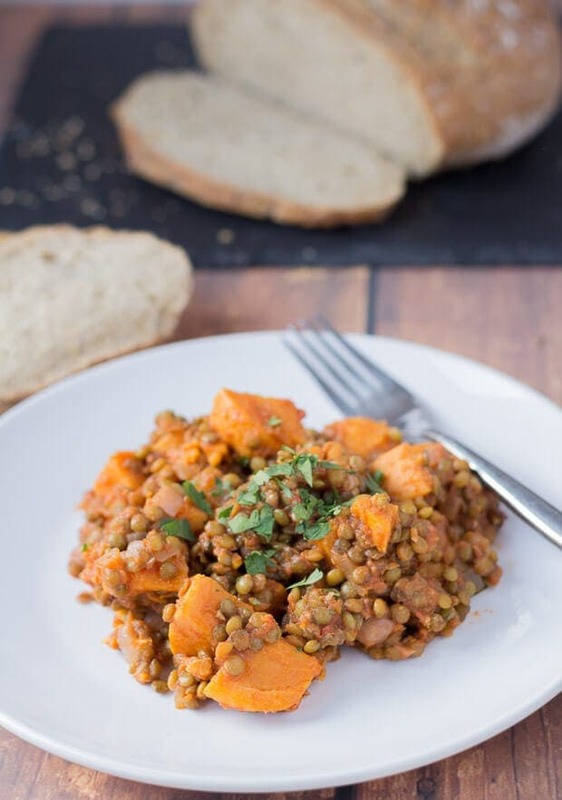 Green lentil and sweet potato stew is a fantastic, budget winter warmer. Comforting, filling and tasty all at the same time, this one pot wonder is just what you need to soothe away those seasonal colds and long dark winter nights. This stew will stick to your bones! Folks, all I can say is thank goodness for this amazing green lentil and sweet potato stew which has seen Lady Lynne and I through some pretty grueling weather and long dark cold nights this winter in Scotland. Maybe now with April being here things will change? April. Haven’t I just written “welcome to March”? Oh well if time is flying by, maybe in no time at all we’ll all be into summer and some warmer weather which we could certainly do with! 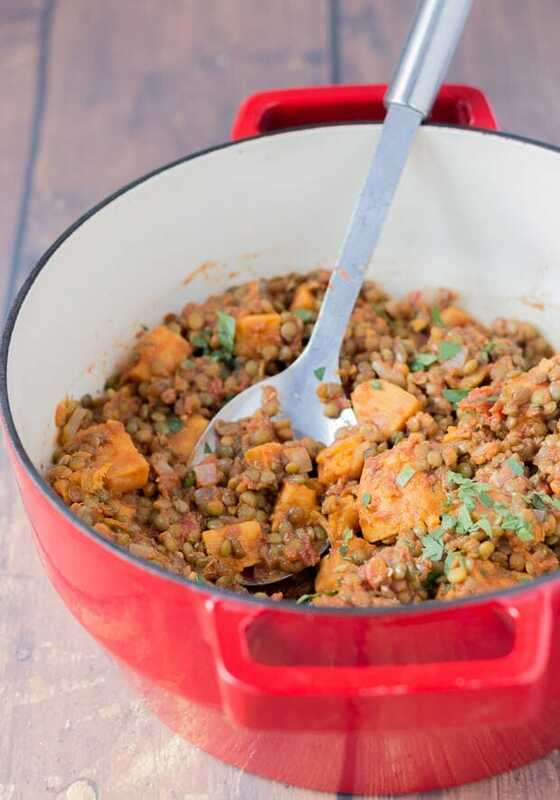 But wishing for summer aside, let’s talk about this amazing green lentil and sweet potato stew. This is a thick, hearty stew. Yes you can add more liquid to alter the consistency, no problems. As with any of my recipes please feel free to change what you want to suit them to your own taste preferences. The reason why I like this being a thick stew is that you can spoon it onto slices of crusty bread! Now that may not exactly be the conventional way to eat and enjoy a stew, but I’m no conventionalist. I say “do what feels right”, and what’s feels right here is mouthfuls of crusty bread topped with this stew! So this is extremely filling, but it’s also really cheap to make too. I can get 6 portions of this recipe for just a few pounds! Folks, when it comes to affordable healthy eating, lentils are just brilliant. Not only are they abundant in nutritional goodness but they’re also extremely versatile in the kitchen. There’s just so many ways to cook with and eat them without getting bored. Make sure you have lentils as one of your kitchen staples. I always have red lentils and green lentils to hand. 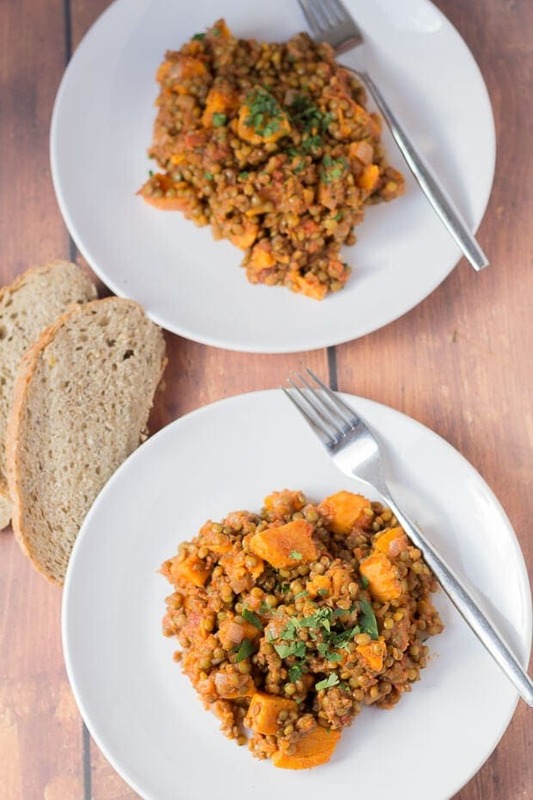 It’s easy enough to put together a cheap lentil meal like this green lentil and sweet potato stew or a simple lunch like Carrot and Lentil Soup. It’s made from green lentils which contain high levels of soluble fibre which help to lower cholesterol levels. Sweet potatoes have a lower GI than white potatoes. Their natural sugars are slowly released into the bloodstream. Both green lentils and sweet potatoes are a source of vitamin B6 which manufactures hemoglobin, a red protein essential for transporting oxygen in the blood. It’s perfectly easy to make this recipe vegetarian or vegan. Just ensure that you substitute the Worcester Sauce (normally contains anchovies) for a suitable alternative. I’ve seen that a vegetarian version does exist in some shops, or you could make your own vegan version using this Vegan Worcestershire Sauce Recipe. 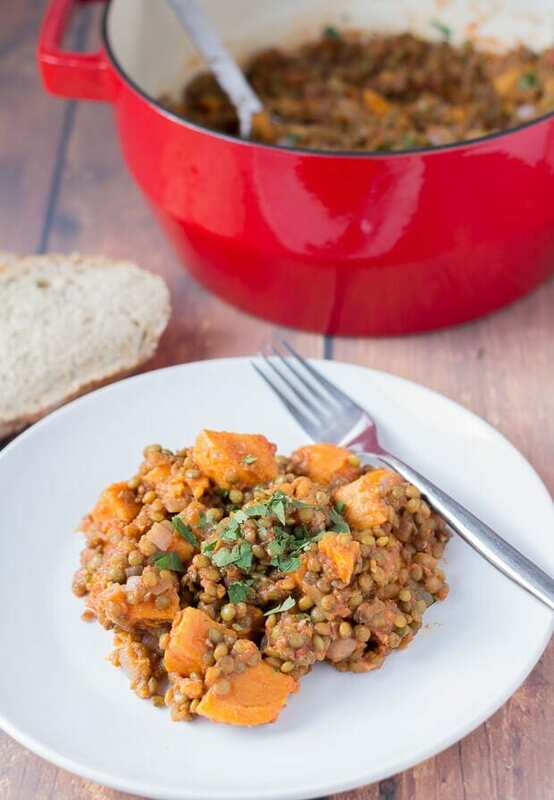 Green lentil and sweet potato stew is a fantastic, budget winter warmer. Comforting, filling and tasty all at the same time, this one pot wonder is just what you need to soothe away those seasonal colds and long dark winter nights. Heat the olive oil in a large pot over a medium heat and sauté the onion and garlic for 3 – 4 minutes. Add the green lentils, sweet potato, chopped tomatoes, stock, paprika and Worcestershire sauce to the pot. Stir well, bring to the boil then turn down to simmer and cook for about 45 minutes, stirring every now and then until the lentils are cooked. Add more boiled water from a kettle if stew needs more liquid. Season to taste. Serve with the parsley sprinkled over and some crusty bread. If you enjoyed this green lentil and sweet potato stew recipe then why not try one of my other popular one pot recipes like my Vegan Sweet Potato and Kale Hotpot, or for those of you who are meat eaters then you’re sure to love my Quick Healthy Chicken Stew. I really should cook with lentils more often. This stew looks amazing, and I love finishing it with fresh parsley. Fresh herbs are key to almost all recipes, but even more so in the middle of the winter! I also love that you scoop this “stew” with chunks of crusty bread. That sounds like my kind of comfort food right there! Thanks for the idea…and reminder about lentils! Thanks David. Yes I most certainly agree that fresh herbs are the key to most recipes. Especially one pot stews like this. The combination of lentils with fresh herbs gives a recipe a real “earthy” wholesome feel, don’t you think? This is just wonderful. So hearty and flavorful. My husband would require this as a side dish, but not me! Yup, time is flying. Did you say summer? Trust me, in no time we’ll be into winter again…and considering what’s going on outside, there’s a chance we won’t see summer this year at all 🙂 And this stew is certainly my kind of meal. I don’t remember if I’ve ever combined lentils with sweet potatoes, but I do like how this sounds. I have been waiting to stop by and read about this recipe on your blog, Neil! This looked so good on Instagram and that ingredient list makes it sound so darn delicious! 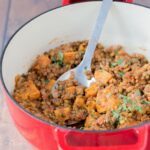 I don’t use Worcestershire sauce often with lentils so I cannot wait to give this thick, hearty and budget friendly green lentil and sweet potato stew a try! While I always have orange lentils on hand, I never seem to have green ones – I need to head to the store and pick some up pronto! Now – looking forward to that Lemon Blueberry Yogurt Cake coming up! Hoping you and Lady Lynne are having a wonderful week! This looks so warm, hearty and comforting Neil, just what we need here as we head into the colder months. I use lentils in many recipes but never in a stew before. It sounds delicious, love to give it a try.